64 year old Orkney based ultra-marathon runner William Sichel to run Self-Transcendence 3100 Mile Race 2018 after accepting an invitation to return to New York for the 22nd edition of the worlds longest certified footrace which starts on June 17th with a 52-day time limit. 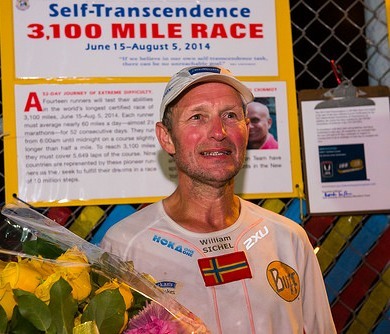 William became the oldest ever finisher of the event in 2014, his debut, when completing the distance in 50 days 15 hours, 6 minutes and 4 seconds – an average of over 427 miles a week for the duration. William had been on the verge of competing in the same event last year when he was forced to withdraw in dramatic circumstances when his wife, Elizabeth, received a shock, terminal cancer diagnosis just a few hours before William’s departure for America. “I have to admit the circumstances were pretty extraordinary by any standards and Elizabeth always said I had to cope with a ‘double blow’ with both her bad news and having to abandon such a high-profile event that I had spent many months preparing for. In fact, ridiculous as it sounds, Elizabeth didn’t want her situation to be the reason I didn’t go to New York and still wanted me to start the race even after we had received the tragic news. To be honest, as soon as the telephone call came in, my mindset had just changed in a flash, in a microsecond and from that point on I was focussed entirely on her care and comfort, with the race a very distant thought. No one could have foreseen that 24 days later Elizabeth would have passed away. Her death will, for me, always be linked with the 3,100 and it will be a poignant return in June. Long ultra-races are always deeply emotional experiences for me and this year in New York it will be especially so. How that will affect my performance no one knows. The race organisers were incredibly sympathetic to William’s situation last year and in fact welcomed his crewman Alan Young to the race where he became a key part of the organising crew that keeps the race going over such an extended period of time. William has also found that running has played a beneficial role in his bereavement process and has helped him to slowly adjust to his new life. The daily discipline of training forces a structure into life, at a time when all structure has been removed. Also, the physical exertion seems to allow deep emotions to be expressed. In addition to that being part of small community has also been a big help. “I’ve been involved in running since 1992 and ultra-running since 1994 and over that time I’ve gone from running a 2:38 marathon right up to setting an overall British record for 5000 km. It’s been a very gradual progression over all those years. Once I moved to multiday races in 2006 I always saw the 3,100 as the ultimate goal but never thought I would be able to engineer my life to make it possible to go away for two months. In fact, I was able to make it happen and it was one of the most incredible experiences of my life. I always describe the first half as having been ‘like hell’ and the second half as ‘like heaven’ as that describes my roller-coaster experience during my 50-day journey. William now has a short training break in southern England before fine-tuning his preparation for his first trip ‘down under’ for the Australian 48 Hour Championships which start in Canberra on March 16th. This will be William’s only race prior to New York. William is currently pursuing his record-setting project called “Journey to 750” in which he is attempting to set 750 running records at World, British and Scottish level, including age-group records. Currently he has set 433 records, including 45 world age-group records and two Guinness World Records. His shortest record is for 30 miles on the track and his longest is an overall British record for 3100 miles/5000km on the road.